In an atmosphere where even huge businesses are struggling to find space and presence in the digital universe, you as an entrepreneur must make sure that your organization is not left behind in the race. Having a digital checklist will not only help you gauge your company’s digital strength but paves way for immediate, smooth redressal on any issues that may arise. 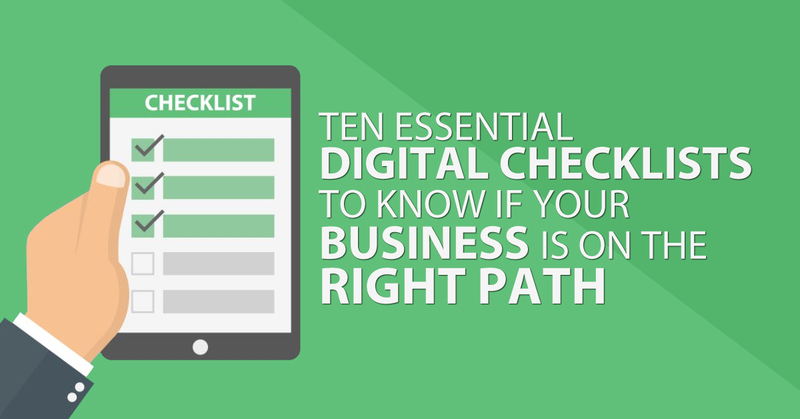 Here is a well crafted checklist to help you find if your business is on the right path digital success. You can compare your business website as your company’s ‘digital office’. You would like your physical office to impress visitors, clients and potential clients with quality, hygiene and design aesthetics. Similarly, when people visit your website, try making the experience memorable for them. You call a website responsive if it has been designed keeping the end user in mind and which also can respond accordingly to the technology or the device which the customer is using. 2. Does your website have a blog? Running a blog for your website comes with many benefits. Firstly, you’re adding value to your customers and positioning yourself as a thought leader in the field. Secondly, running a blog which is continuously updated with respect to the buyer journey helps customer build trust, interaction and engagement. 3. What about Search Engine Optimization? There’s a funny saying that the best place to hide a dead body is the second page of Google search results. Millions are online and those millions go to Google to find answers. And seldom is someone interested on navigating to the second page. It’s like how most people only remember the first person to land on moon, not the second one. And Search Engine Optimization (SEO) is the golden way of increasing your brand’s visibility online. Making sure your SEO is strong will reap benefits multifold. It doesn’t matter if you run a business that holds 100 years of heritage or a struggling start-up, customers expect you to be social and friendly. Facebook, Twitter, LinkedIn, Instagram, Pinterest, Medium, Quora, Tumblr, Foursquare are multiple channels where you can interact, engage and get to know your customer. Although social media does help build your brand presence on a phenomenal level, it’s a double edged sword if you don’t know how to tread it. Bad word spreads around faster than good ones humbling the reputation of big brands. But it’s also fun (think the brand battle on social media between Burger King and McDonald’s). Key point being, know your customer and social media will be a great boon. The importance of analytics when it comes to digital marketing can’t be ever underplayed. More than just giving you data analytics help you understand the behavior of your consumer. With a huge array of metrics to monitor your campaigns, analytics will let you know what’s working and what’s not so you could be better the next time. What more do you need? 6. How good is your paid promotions strategy? While you might be tempted to think that content marketing is a cheaper alternative to paid promotions, these two elements are not absolutely mutually exclusive. You might have taken a lot of pain to produce quality content. But what about getting it in front of the right audience? This is where a good paid promotions strategy comes in handy. An integrated approach which combines paid and owned content with the right strategy can produce great results for your business. 7. Are you neglecting email marketing? Email is not dead. It’s not old. It’s more relevant in the present scenario to project personalized services. In fact they are better than social media in terms of customer acquisitions and retaining. According to a study conducted by retail professionals, email marketing actually topped the list of digital tactics that drive customer acquisitions. This is because emails are customizable according to the stage where the customer is in the buyer’s journey and not to mention their efficiency is measurable. In short: email marketing can do wonders for your business. 8. Are you leveraging the power of video marketing? A picture is worth a thousand words. But a video is worth a thousand words and pictures combined. Videos are gripping, viewers don’t have to spend as much energy as wading through text or understanding an image. There are various digital channels where you could use videos to attract customers- some are YouTube, Facebook, Vine, Vimeo, Daily Motion, Instagram etc. Each channel has its own formats and style and using it accordingly will take your company’s brand presence to whole new level. Big business or small, when it comes to social media, reputation is a crucial factor. Some big brands have lost all of what they have earned just because they weren’t attentive to what conversations people were having about their brand. Not only that, ORM also entails the process where you redress a grievance immediately and show your customers why they should trust you. Failing to plan is planning to fail. Enough said. All the above discussed facts can culminate into success only they are governed by a well defined strategy. A well crafted strategy is in tandem with the overarching marketing goals of the business and is very specific, detailed in nature. Thus, a strong strategy is the most essential checklist to ensure that your business is on the right path. Learn how to craft the perfect marketing strategy here.